23 August – 2 September 2019, 10 nights/11 days: £2999 plus £45 per night single room supplement, where applicable. Places available. 21 August – 31 August 2020, 10 nights/11 days: £3299 plus £50 per night single room supplement, where applicable. Places available. The Holocaust (from the Greek: hólos, “whole” and kaustós, “burnt”), also known as the Shoah (Hebrew: HaShoah, “the catastrophe”), was a genocide in which Adolf Hitler’s Nazi Germany and its collaborators killed about six million Jews. The victims included 1.5 million children and represented about two-thirds of the nine million Jews who had resided in Europe. Some definitions of the Holocaust include the additional five million non-Jewish victims of Nazi mass murders, bringing the total to about 11 million. Killings took place throughout Nazi Germany, German-occupied territories and territories held by allies of Nazi Germany. From 1941 to 1945, Jews were systematically murdered in one of the deadliest genocides in history, which was part of a broader aggregate of acts of oppression and killings of various ethnic and political groups in Europe by the Nazi regime. Under the coordination of the SS, following directions from the highest leadership of the Nazi Party, every arm of Germany’s bureaucracy was involved in the logistics and the carrying out of the genocide. Other victims of Nazi crimes included ethnic Poles, Soviet citizens and Soviet POWs, other Slavs, Romanis, communists, homosexuals, Freemasons, Jehovah’s Witnesses and the mentally and physically disabled. A network of about 42,500 facilities in Germany and German-occupied territories was used to concentrate victims for slave labor, mass murder, and other human rights abuses. Over 200,000 people are estimated to have been Holocaust perpetrators. The persecution and genocide were carried out in stages, culminating in what Nazis termed the “Final Solution to the Jewish Question” (die Endlösung der Judenfrage), an agenda to exterminate Jews in Europe. Initially the German government passed laws to exclude Jews from civil society, most prominently the Nuremberg Laws of 1935. Nazis established a network of concentration camps starting in 1933 and ghettos following the outbreak of World War II in 1939. 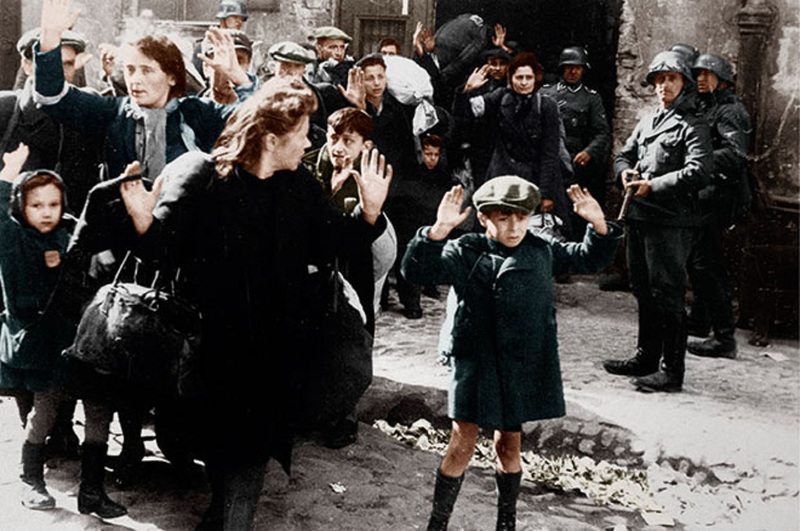 In 1941, as Germany conquered new territory in eastern Europe, specialized paramilitary units called Einsatzgruppen murdered around two million Jews, partisans, and others often in mass shootings. By the end of 1942, victims were being regularly transported by freight trains to extermination camps where, if they survived the journey, most were systematically killed ingas chambers. This continued until the end of World War II in Europe in April–May 1945. We visit: the Lodz Ghetto, Chelmno Extermination Camp, Warsaw Ghetto, Lublin Ghetto, Majdanek Concentration Camp, Trawniki Forced Labour Camp & Ukrainian Guard Training Camp: the home of the notorious “Hiwis”, Belzec Extermination Camp, Lviv Ghetto (Ukraine), Sobibor Extermination Camp, Treblinka Extermination Camp, Warsaw Ghetto Uprising, Krakow Old Jewish Quarter: Kazimierz, Krakow Ghetto: Podgorze, Plaszow Forced Labour Camp & Oskar Schindler Story, Auschwitz I, The Ramp & Auschwitz II Birkenau Camps. We have overnight stops in Lodz, Warsaw, Lublin, Zamosc, Lviv and Krakow. Drive to Lviv (stay Lviv). Lviv Ghetto and clearances. Plaszow Forced Labour Camp, Kraków & Oskar Schindler Factory, Kraków drive back to Warsaw arriving central Warsaw 17:30. We explain the Holocaust from the development of the T4 Euthanasia Project to the hell that was Auschwitz. On the way we see and explore the initial Einsatzgruppen Actions in Poland and the participation in massacres by the Reserve Police Battalions. We explain the formation and life in the Jewish Ghettos and the heroic but tragic Ghetto Uprising and their liquidation and the subsequent Transports to the Death Camps. We explain the history of the Camps and the process of organised murder from the initial killings of the Gas Vans at Chelmno through to the big three Operation Reinhard Extermination Camps of Belzec, Sobibor and Treblinka. We visit little known places such as the Ukrainian Guard Training Camp at Trawniki which was also the scene of one of the largest massacres of the war: the Operation Harvest Festival slaughters near Lublin as the SS Economic workplaces were ‘cleared’. From despair we see a glimmer of hope in the Death Camps as the prisoners rose up in a desperate attempt to flee their captors and destroy the murderous facilities. Finally, as the Red Army advanced, we see how the Camps were closed down and all traces of existence removed as Auschwitz Birkenau, further to the West, took on its most deadly phase of murder. On this tour we trace the Jewish culture that was so prevalent in this part of Europe for hundreds of years and the attempt at its systematic destruction by the Nazi regime. This is a once in a lifetime trip and is MHT’s dedication to all those who suffered in the Holocaust. £500 per person deposit payable to secure a booking, £1000 installment payment due no later than 12 weeks before the trip with the final balance due no later than 4 weeks before the trip.